Impulse buying is a surefire way to ruin your budget and remain broke, no matter how much you earn. And we can all succumb to it from time to time. That trip to the supermarket for milk where you ended up spending £25? Impulse buys. Adding clothes to your online basket when you were just browsing for fun, and ending up purchasing? Impulse buys. About 90% of the items we buy on sale? Impulse buys! Why are impulse buys such a budget killer? Well, firstly, they aren’t in the budget, meaning that you’ll overspend. And if you keep impulse buying, you’ll eventually resort to using debt to fund it because you can’t sustain impulse buying indefinitely. Secondly, we are paying for something that loses its appeal within moments. When we are shopping and see something that we love, buying it improves our mood and gives us a hit of excitement- for about four seconds. Unfortunately, after the thrill is gone, we go back to how we felt before. Only now we have less money, which is an issue when you’re sticking to your budget, trying to get out of debt and build wealth. You aren’t really getting value for money when you buy something you didn’t want or need a few moments before you saw it. So, with Christmas on the horizon, and New Year’s resolutions ahead, here are some key tips for you when you’re tempted to impulse buy. Wait: The easiest way to stop impulse buying is by never purchasing the first time you see an item! If you see something you love, wait a few weeks. You could pin it to a Pinterest board, or set a reminder in your calendar to re-visit it then and if you still feel the same desire to buy, then do it. I guarantee in 95% of cases, you’ll wonder what you saw in it in the first place once that love at first sight wears off. Evaluate if it’s a necessary purchase: This tip is particularly valuable when you’re buying for other people. For example, at Christmas, the shops are crammed with shoppers buying presents, and let’s face it, none of us need another soap set. How many of us would enjoy Christmas a little more if we didn’t have to buy as many presents, in exchange for not receiving as many presents? If you’re finding yourself with a long list of obligation presents to buy, why not see if you can agree with some of your would-be recipients if they would be happy to not exchange gifts this year? The chances are, they’ll be relieved to cut down their list, too. 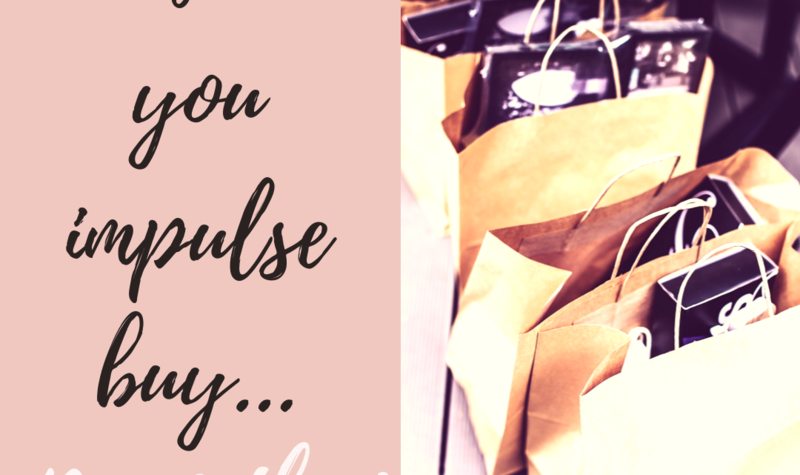 Figure out your patterns: Impulse buying is emotive, and usually we are motivated to purchase what we feel a purchase would give us, such as status or self-esteem, rather than the actual item itself. What do your purchases say about you? Be honest with yourself- if your motivation is for anything more than to acquire something that you’ll probably not use after about six months, unfortunately, that purchase will never satisfy your craving. It will serve no purpose other than keeping you in debt, or spending that money you would otherwise have saved. The great thing is that once you know your motivation for impulse purchasing, you can actually start to give yourself what you really want under that impulse buy. You deserve better than to be broke and miserable with a load of stuff that never truly gives you want you want. Equate purchases to hours, not money: This great little tip extends to all purchases, including impulse buys. Figure out your hourly rate of pay after tax and then use this as an indicator of how much an item is worth. You can them quantify how long it takes you to earn the item and often, it makes an impulse buy seem really frivolous when you realise you’d have to work six hours to pay for that top. Appreciate it… and then walk away: This tip from The Minimalists changed my life when we were paying off debt. Appreciating things I see online or in-store and then just walking away has saved me thousands of pounds I would otherwise spent on impulse buys. It’s such a simple concept, but so rarely applied in our culture, where we are hardwired to acquire everything we see at any cost. Previous to paying off debt, I was obsessed with filling my life with things that I thought would improve my life or make me happy. Then I realised that this behaviour was the main cause of my debt, which took away my choices, negatively affected my life and made me unhappy. So in effect, buying things with the end goal of happiness is counter-productive. So when you see something you think you must have, trying appreciating it for how beautiful, innovative or wonderful it is, and then walking away. You don’t need to buy everything you see. But occasionally we all impulse buy. Let’s face it, there are times when we need or want something, and we just go for it there and then. So of course there are ways to limit damage control and doing it guilt-free. Build it into the budget in advance: If you know you will absolutely impulse buy, and the thought of picking up little treats here and there will spur you on to be sensible with your money the rest of the time, then if you budget allows you to, build it in! You can create a miscellaneous section in your budget, or just top up all of your budget categories (such as groceries, clothing etc.) with a few pounds to cover the impulse buys. Better to budget to spend than to deny yourself and go over budget anyway. Make sure you get the best price: If you see something you like, having a quick check online to see if it’s cheaper elsewhere never hurt anyone. Don’t forget to check if you can get it second hand (I loved this approach to children’s toys in particular when it was trialled in Shop Well For Less a few times, where the families saved at least 50% on the RRP and the children didn’t even have a clue). And of course, don’t forget Topcashback and Quidco on everything you buy online! 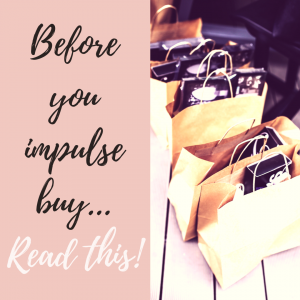 Now, leave a comment and tell me your best impulse purchase story! Was it something you really regret, or are you actually really glad you went for it? Or have you got willpower of steel and never buy on impulse? Thanks Emma, same here thankfully! I have had my share of impulse buys in my time. However my will was put to the test earlier this year. My Husband had just been made redundant when I accidentally spotted a teal coloured Mac I have been after for years in Hobbs. I had the Money in the bank, but not knowing how long my Husband would be out of work I decided not to buy it as it didn’t really need it. 9 long weeks I lusted after that coat, continually checking whether it was still available in my size. It was the first thing I purchased when he went back to work, but by waiting the price was then reduced by 25%! I love that coat and wear it most days. I think I like it so much because by waiting I realised that I really wanted it. That’s so lovely, Jo! It’s great to hear that the price went down too (kind of like a little reward for waiting so long! ), and it just goes to show that it’s something you will really get value from because you waited so long to buy it without forgetting about it. And also well done to your husband for finding a new job so quickly!